Mui-Ling Teh is an artist, photographer and poet of Japanese and Chinese descent. She produces art both traditionally and digitally through a variety of mediums; but at present she is best known for her miniature origami. Teh’s interest in origami arose upon hearing the story of the Thousand Paper Cranes when she was in elementary school; and years later, in 2008, she began folding a series of miniature creations. Combining with her interest in other fields of art, Teh initially used her miniature origami as photography props, and sometimes wrote poetry to accompany her vision. In every image she produces she strives to create a concept or a story; sometimes based on the paper crane’s symbolism of peace and good luck, and the Japanese legend that goes that if one folds a thousand paper cranes their wish would come true. 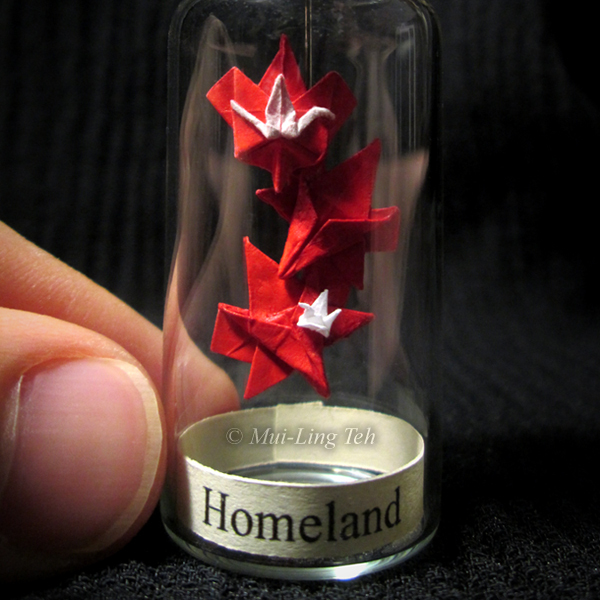 In 2014, she began incorporating her folded miniatures into glass bottles; often accompanied with inspirational words or messages – an element inspired by her poetry. At the same time, she began participating in events where she exhibited and sold her creations. As of 2015, she has also taught origami at different workshops, and occasionally creates and sells art to raise funds for different causes, charities and non-profits, including Japan Earthquake Tsunami Relief, ALPHA Education, and Camp Ooch. Teh hopes to become more involved in the Japanese community and the art community in Toronto to share her love and joy for art and origami.